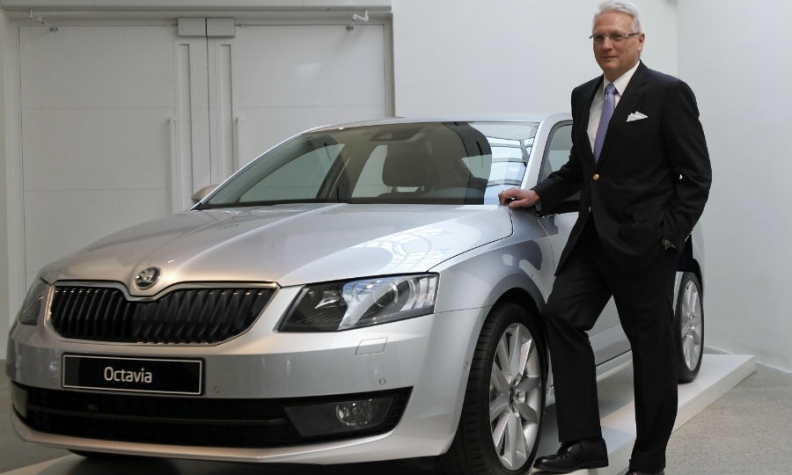 Vahland, pictured next to the Skoda Octavia, had hoped to succeed Martin Winterkorn as VW CEO. Volkswagen's designated North America chief, Winfried Vahland, quit because Martin Winterkorn was no longer the automaker's CEO and because his wife didn't want to move to the U.S., a source familiar with the executive's thinking told me. Vahland, a restructuring specialist and 25-year VW Group veteran, was due to lead a newly created North America region for the automaker starting in November. Two sources at the company familiar with the matter supported the official statement that Vahland decided to leave VW because of differences of opinion over the automaker's North America strategy. His resignation was made prior to Tuesday's first meeting of the new VW brand management board, to which he was assigned, they told me. "I don't think the decision to leave was an easy one for him, but the North America posting was a job he and Winterkorn had hashed out together before the crisis. He would have done it for him," said one of the sources. Vahland decided to resign for personal reasons following the appointment of Porsche boss Matthias Mueller as new VW Group CEO, a position Vahland had designs on, the source said. "The immediate catalyst however was his wife, who told him a few days ago he could go to the States, but if he did it would be without her. She already spent 25 years moving from country to country with him -- Brazil, China, Czech Republic and so on -- for his VW career," the source said. "I don't think he has received an offer to work somewhere else, I think other things now take priority for him outside of Volkswagen." Vahland, 58, has been CEO of VW's successful Skoda division since 2012. Before that he was the automaker's boss in China where he revived VW's ailing operations. Vahland was supposed to move into his new office in Herndon, Va., near Washington. Instead he leaves VW scrambling to fill the void. His departure could be a huge boost to Michael Horn, the German currently running VW's operations in the U.S. who would have reported to Vahland. After the diesel emissions scandal broke, Horn was expected to have to fall on his sword. U.S. dealers stepped in to prevent that threat and now his star looks to be on the ascent. Horn's contrite apologies, forthright pledges to do what is necessary to keep customers happy and an almost shocking candor in moments under duress have risked the ire of his superiors, but won him plaudits from outsiders. His testimony in front of U.S. congressmen could have been a huge public relations disaster. Horn was a foreign manager from a German carmaker that acknowledged years of deceitful practices -- for career politicians in Washington looking to score easy points he was the epitome a fat, slow-moving target. Like fishing with dynamite probably. Instead he passed this baptism by fire with poise and composure. At this point, whether executives in Wolfsburg like it or not, he is now the face of VW in the U.S. and is now the best candidate for Vahland's replacement.